The winning MoonBot from team Landroids, with its original claw design. Ateam of eighth-grade students from New Jersey has wonfirst place for its miniature lunar rover made entirely out of LEGOpieces. Thecompetition, called MoonBots, is the mini version of the Google Lunar XPrize,which challenged teams to land an actual rover on the moon and offereda prizeof $30 million. While not a trip to the moon, the student winners landa tourof the LEGO factory in Billund, Denmark. Theteam,called Landroids, built a four-wheeled robotaccessorized with a motorized arm and a basket for collecting moonsamples. Theminiature machine successfully maneuvered along and sampled from alunar-likesurface, equipped with craters, moon rocks and other rough terrain. TheLandroids are "very excited" about the visit to the land of LEGOs,team leader John Yeh told TechNewsDaily. The Shadowed Craters team fromCalifornia snagged second place, while the Moonwalk team from NewJersey andConnecticut came in third. Thecompetition was sponsored by the X Prize Foundation and LEGO Group; thewinnerswere announced last Wednesday. Eachof thecompeting teams was given a set of tools to design, build and controlthe lunarrobots. 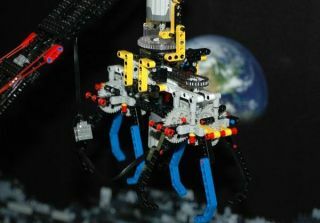 Their toolbox included motors, sensors and LEGO bricks, as wellas oneLEGO MINDSTORMS NXT Intelligent Brick, which is a computer chip withFlashmemory and Bluetooth capability that served as the robot's brain. Theteamsdesigned the colorful mini-bots using LDRAW, LEGO Digital Designer orGoogleSketchUp software. The designs along with video essays and blogs weresubmittedto the judges. Thedesignphase of the competition let the teams refine their robots. TheLandroids team "exploredquite a few different options" before settling on the final design, Yehsaid. In particular, the team changed the design for themoon-rock-grasping armfrom a complex double claw to a simple fork. "Eventuallywe had to give [the double claw] up, because moving something with thatmuchmass, it was just too difficult to control the turning accuracy," Yehsaid. Inthe final phase of the competition, therobots created by the top 20 teams got to strut their stuff andperformed asimulated lunar mission on a LEGO mat. Thelunar simulation "very closelyparalleled the work our Google Lunar X Prize teams were doing," saidWilliam Pomerantz, senior director of Space Prizes for the X PRIZEFoundation. Amongother lunar tasks, the robots had tofind and collect water ice and Helium-3 samples, photograph artifacts,survivethe lunar night, and return to base in less than three minutes of itsarrivalon the moon. Survivinga night on the moon was simulatedLEGO-style by maneuvering the robot to the Peak of Eternal Light ? aminiatureversion of a region on the moon where the Sun never sets ? and stoppingforfive seconds. This article was provided by TechNewsDaily, a sister site to LiveScience.